When a background check on an applicant and/or current employee or tenant yields negative results, your next move seems obvious: Grab the next application and move on! Right? Not entirely. When taking adverse action, following the rules is paramount. If your reason for deciding not to move forward in hiring or retaining this individual is related to information contained in their background screening report, you are bound by the FCRA (Fair Credit Reporting Act) to fulfill their adverse action letter obligations. Any time that landlords, employers, or lenders make use of a third-party CRA (Consumer Reporting Agency), they are required to remain compliant with the FCRA by delivering adverse action notifications correctly, and in a timely manner. As individuals who are presumably not well-versed in the regulations of financial institutions, you may be feeling some anxiety about your ability to handle these adverse action letter obligations. These notifications must be delivered to the recipient with specific information and in an appropriate time frame. 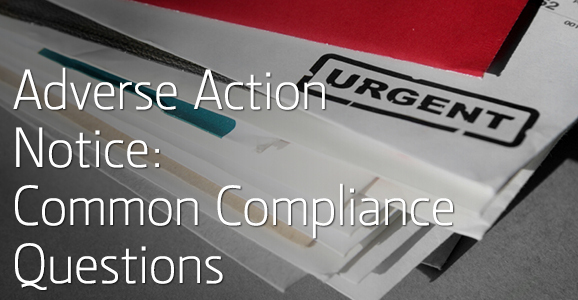 To assist you in remaining in compliance with the FCRA, here are a few of the most common compliance violations related to adverse action. When sending Adverse Actions, timing is everything. Several years ago when the economy was booming, there was less need for notification of adverse action. It was an applicant's market, with fewer individuals applying for jobs or looking for housing with lower rent. Nowadays, however, every job opening yields an overwhelming number of applications and every apartment or home with reasonable rent is flooded with interested renters. These individuals must all be screened by a professional, third-party background check company to avoid the potential risk of negligent hiring and for your peace of mind. Pre-Adverse Action Notice: When an applicant's background check shows undesirable behaviors from the past, you should send a pre-adverse action notification. This letter is sent before adverse action is actually taken and informs the individual that based on the information in the CRA report, their application will be denied. Further, the employer must provide the applicant/employee with a copy of his/her background report, a copy of “A Summary of Your Rights under the Fair Credit Reporting Act,” and a reasonable period of time to dispute the accuracy or completeness of information in the report. This allows the applicant to respond to the findings and dispute any inaccuracies. The FCRA does not specify how long an employer must wait after the pre-adverse action notice before actually taking adverse action. The applicant must have a meaningful opportunity to review the information and to respond. The FTC has suggested five business days as a reasonable amount of time. Though it is not required by the FCRA, it is recommended that the pre-adverse action notice be provided to the applicant/employee in writing. Adverse Action Notice: If, after a reasonable amount of time, the applicant has not appealed the pre-adverse action letter, you must proceed with your adverse action letter obligations by sending official notice. This notice may be given only after you have followed the required pre-adverse action process and the applicant/employee has had the opportunity to dispute. The notice must be in writing and contain the information listed below. State that the adverse action is based either in whole or part on information contained in the background report provided by the CRA. Name, address, and toll free telephone number of the CRA you used. Statement that the CRA supplying the background report had no hand in the decision to take adverse action and cannot give specific reasons for it. Notice of applicant's right to dispute the accuracy or completeness of the provided information (covered in the Pre-Adverse action). Notice of applicant's right to another free consumer report. This is provided upon request of the CRA within 60 days. To learn more, download our Complete HR Screening Kit for sample templates or read about our free online portal for consent and adverse action.